This past Sunday, I wrote about how during Palm Sunday Mass, we read through Jesus’ final hours from his arrest to his death and burial for our Gospel reading. Easter is tomorrow! And that marks a joyous occasion for every Christian life because we celebrate an empty tomb because He is not there! He is risen! Jesus wasn’t joking! Last year I wrote about how I noticed (seeming coincidentally) how nature itself was signifying Lent and preparing for the Resurrection. But this year…I wanted to focus on something else–perhaps the true reason for the season. As a Christian, it’s always tempting to focus on the “feel good” parts of the faith. Or on the “feel good” parts of Scripture. And Jesus’ Resurrection is definitely one of those “feel good” moments because yes, He conquered death! Yes, He opened up Heaven! Yes, this is the source of our future resurrection in Him! Yes the Resurrection is what saves us! And all that jazz. But sometimes it’s too easy to get caught up in all that, as if it was the only thing that mattered or the only thing that I should focus on as a Christian. But, in learning more about my faith and gaining a deeper understanding of it, I’ve come to know and appreciate that the Resurrection means absolutely nothing unless Jesus died. In other words, there would be no point to the Resurrection unless Jesus first had to die. And not just any kind of death. Death! On a cross. But even the death on a cross is just a portion of all that He had to endure. 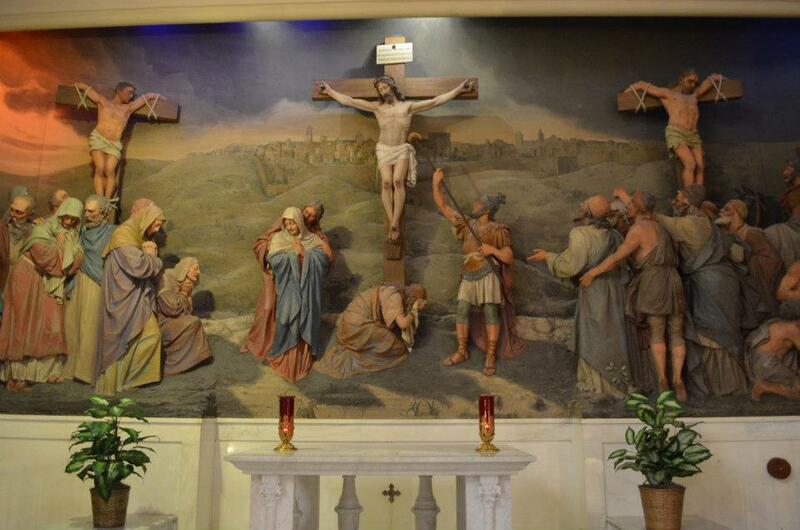 from the Franciscan Monastery of the Holy Land in Washington, D.C.
What a sight Jesus must have been to behold for He looked quite less than a man! His skin torn apart with the nerves exposed from vicious flagellations by the soldiers, drops of blood freely dripping from his head as a crown of thorns penetrated his scalp, and now presented in public facing the bloodthirsty cries of the mob. Though He was in physical pain, I know from the night before He was in great emotional pain from such incredible distress of bearing the weight of all sin that He sweated blood, and surely His skin was already tender and bruised from enduring that particular suffering. How incredibly humiliating it must have been for Him to stand before the crowd in such a broken and bloody state! Yet, even as the Son of God, He does nothing to save Himself from enduring all this suffering. A great act of humility through humiliation. This past weekend, I’ve mentioned previously (still a future blog post), I was on a silent retreat meditating and contemplating various things regarding the faith. One of those things was the Passion of Jesus, which includes this scene of Pilate presenting Jesus to the crowd. Part of our meditation on the Passion was to ask God for us to share in His suffering during that process. And while kneeling there in the chapel with Jesus present in the Eucharist, I asked (actually…we were told by our retreat leader to beg) Him to let me feel what it must’ve felt like for Him to suffer. I decided to begin with Him praying in the garden of Gethsemane where He bore the burden of sin. Everyone’s sin. Past. Present. Future. And, I think He gave me a slight taste. It was borderline terrifying because my interior felt surrounded by a terrible inky blackness that nearly felt suffocating. Sometimes I tend to have a vivid spiritual imagination, but yikes! That…was really uncomfortable even if I imagined it or not. Recorded in Scripture is how Jesus started sweating blood in Gethsemane the night He was arrested. This is a real medical phenomenon called hematohidrosis. He couldn’t handle it! But, because of His obedience to God the Father, He endured. The cup will pass. I went to bed after reflecting on this aspect of His Passion during the retreat. All of us guys were assigned an hour to spend with Jesus. I had an assigned hour from 5AM-6AM to spend with Jesus in Adoration the next morning. During that time, I mostly spent reading the meditation at the end of A Doctor at Calvary by Dr. Pierre Barbet. He goes through the Passion from a medical surgeon’s perspective. I couldn’t handle some of it because of the technical way he describes what Jesus must have felt in enduring all the violence He had to endure during the Passion. How can His body endure sweating blood, vicious flagellation tearing apart His skin, crowned with thorns, carrying the weight of the instrument that He will die on and being nailed to it? I can’t even fathom having the strength and willpower to even survive some of the first physical traumas that Jesus had to endure. This past Thursday, I attended Holy Thursday Mass, which celebrates the institution of the Eucharist and the institution of the priesthood from the scenes in the Gospels regarding the Last Supper. Chronologically, this happened the night before Jesus’ betrayal, arrest, and the forthcoming physical sufferings in His Passion. Typically, after Holy Thursday Mass, Jesus in the Eucharist is processed (as in, procession) in the church before resting on an altar for the faithful to adore and “spend an hour” with Him just as He asked His disciples in the garden of Gethsemane. My parish offered Adoration all night, and I was able to catch the last offered hour before heading off to work. I took this time to continue my contemplations from the weekend before at the silent retreat. The images of love that tend to come to mind when thinking about love is definitely not the sight of a badly beaten and bleeding man. But yet, this expresses the Christian understanding of love–the self-sacrificial love, or agape in Greek. Jesus had a mission on this earth and that was to show God’s love for His creation through redemption of our mistakes (all that and more). This is not the superficial type of love we tend to associate with “love” in our modern understanding. This is an infinite love. A total self-donation and giving of self…even through suffering. Jesus could have stopped all the pain and bleeding that He had to deal with. But He kept enduring out of His love for us. The constant flow of His blood during His Passion demonstrates this constant flow of His love for us, is what I wrote in my non-digital spiritual journal. He demonstrates what real love looks like! It is not necessarily all about the warm fuzzies. What gets lost in my modern understanding of love is that love comes at a cost through suffering. Not in a masochistic way, but through the desiring of the ultimate good of the other free from selfishness. What a man! … What a God! These past few weeks have been hard on me for various reasons. How very timely that I had these opportunities to reflect and contemplate on the Passion of our Lord moreso than I have ever before. I find it difficult to wallow and dwell in my own sufferings because they have no comparison to Jesus in His final hours. But His suffering has definite meaning and purpose. He had to die so that He could be resurrected. I find that I’m often in need of a resurrection from my own sufferings, and I’m often on a quest to make sense of all my suffering. So then…I behold the man. Not because I desire His pain, humiliation, suffering, and death like the Sanhedrin and their followers though I do seek a deeper understanding of all that through sharing in His wounds. I behold the man because I’m in need of an example of what love and suffering look like. Why do I need to know what love and suffering look like? Because I need to really learn that my suffering doesn’t go to waste for it has purpose even if I don’t immediately see it, and that I really need to learn that authentic love demands sacrifice and suffering. Love doesn’t feel good all the time. You know…Ciseri’s painting at the top of the page doesn’t express how terribly disfigured Jesus was standing there before the crowd. Though I do appreciate Ciseri’s use of contrasting light in this painting, it doesn’t capture the reality. Perhaps I just keep thinking about the movie, The Passion of the Christ, which was not afraid at expressing the brutal violence against Jesus. I should watch it again to remind myself and to further contemplate His sufferings. Lastly, I’m grateful to be Catholic because through my faith I’m able to enter deeply into the life of Christ, especially the end of His earthly life as I’ve done in the past week. By being Catholic, I’m equipped with various methods of entering into that life of Christ through prayer and general Catholicness. In fact, a whole set of Mysteries for the Rosary is dedicated to meditating upon the agony in the garden, the scourging at the pillar, the crowning of thorns, the carrying of the cross, and finally the crucifixion. Though I’ve only prayed a few times this Lent the Stations of the Cross, a prayer and devotional that follows the major milestones of Jesus’ Passion and death, I need to do it more frequently even as it isn’t Lent anymore. This is not as intense as taking the time to meditate and contemplate in silence, but the Stations of the Cross is still a great way for me to go on a spiritual pilgrimage walking with Christ on the way to Calvary. These are not footsteps in the sand on the beach, but His footsteps on the road to death and the Resurrection. And then there is Holy Week, where the entirety of the Church walks through these times of Jesus’ final hours through special readings and liturgy to help the faithful enter more deeply in the Passion and its significance. Beginning with Palm Sunday, this marks Jesus’ triumphant entrance into Jerusalem where things escalate quickly on the night He was betrayed that we commemorate on Holy Thursday. Then there is Good Friday where we solemnly commemorate Jesus’ suffering and death…which doesn’t sound good, but it is good because it is holy knowing that the Resurrection awaits this Sunday. For now…as today is Holy Saturday…Jesus is in the tomb. Silence and stillness waits. Have a blessed rest of the Triduum and happy Easter!